Boyds, Md. 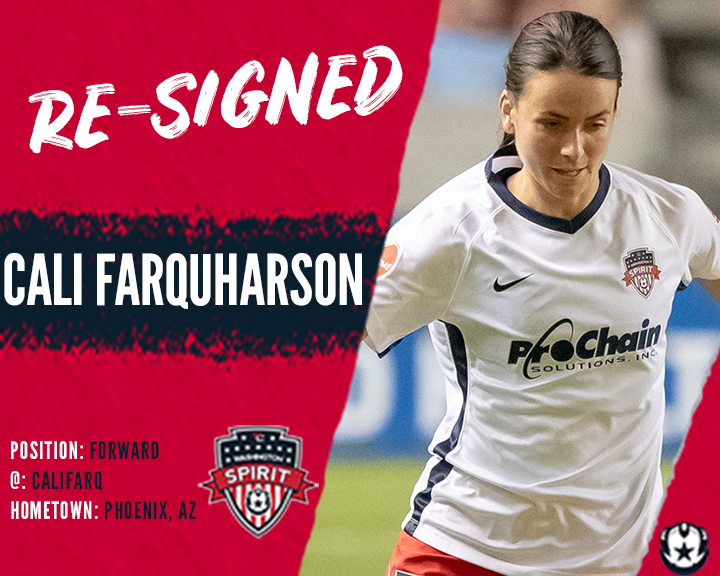 (Feb. 4, 2019) – The Washington Spirit has re-signed forward Cali Farquharson. Per league and team policy, terms of the deal were not disclosed. Farquharson has made 31 appearances for the Spirit since being drafted in 2016, following her illustrious college career at Arizona State University. During the 2018 NWSL season, the former ASU Sun Devil made one appearance before a left tibial stress injury sidelined her for three months. Upon her return, Farquharson made four more appearances, totaling 143 minutes. Farquharson was drafted 12th overall by the Spirit in the 2016 NWSL College Draft. As a rookie, Farquharson played 16 games and started eight, playing 561 minutes. In 2017, she played in 10 games, totaling 352 minutes and 77% passing accuracy, the highest among forwards.